A stunning kitchen can significantly raise the value of your property, add personality to your home and create a true sense of belonging. It can provide a social hub for those who love to play the host, a place for the family to gather for a wholesome dinner, or the perfect environment in which you can whip up your most impressive culinary creations. But what if your kitchen is looking a little tired or worse for wear? It’s definitely worth the time and effort required to achieve your dream design, but you’re likely to tot up a hefty bill if you decide to replace everything with sparkling new fixtures and fittings. So what can you do to save money while upgrading your kitchen and turning it into the space of your dreams? Read on to discover the answers in the Kitchen Warehouse guide to redecorating your kitchen on a budget. Of course, it’s never fun to get right into the corners and dig out the dust, scrape the grease off the cooker hood or polish the worktops, drawers, doors and handles until they shine, but it’s absolutely worth the effort. Once you’ve got your kitchen looking as much like new as is possible, you can take stock of the space, remind yourself of how it looked when everything had just been installed and see which elements you’d be happy to keep and which are beyond salvaging. Not everything that looks shabby is a lost cause – even cupboard doors that no longer fit their frames properly may not be the problem they appear to be; bent hinges can be replaced, so if a door has dropped as the result of hinges warping out of shape, there’s no pressing reason to get rid of it unless you truly wish to. Have a frank discussion about what everyone in your household wants from their kitchen. Your new design should tie in with the look of the rest of the house, but that’s really where the limitations stop. Measure your space and decide on the degree to which you wish it to transform – do you want to simply rip everything out and start again, or are there some bare bones you’d like to keep? Do you like the current layout or will there be anything to gain by changing it? Is the colour scheme working for you? Bearing in mind the current location of plumbing fittings, lighting fixtures and electrical sockets, sketch out a few ideas and decide on your favourites. Is there anything already installed in your kitchen, or lying around your house, that will fit in with your new design ideas and save you from spending needless amounts of money? Remember, with some items such as wooden kitchen units, you may be able to strip back the finish, sand off any paint and retreat it to look like a totally different product. Think outside the box and consider all of the things you could recycle to make your kitchen look fresh and interesting without breaking the bank. If you’re looking for a new kitchen online, be sure to check that the retailer you’re investigating is reputable and provides high-quality products. You should never purchase large items that are intended to serve you for the foreseeable future without first seeing them in person to inspect them and ensure that they look and function exactly how you’d want them to. Visit showrooms for inspiration – even if the units you’re looking at are a little too expensive, they may give you an idea of the style you’re looking for, enabling you to search elsewhere until you find a similar version that fits into your budget. You don’t have to stick to second hand; there are many new cheap kitchen units on the market that are of equal or superior quality to the high-end designer options – you just need to know where to look. You can make a striking difference to the look of a kitchen simply by upgrading the details. Elegant new taps, beautifully designed handles, soft close hinges and much more besides can be added to a space to completely revolutionise its appearance. Avoid needless expense by doubling up appliances and crockery as accessories, choosing kettles, toasters, pans, chopping boards and bins in beautiful colours to add interest. Adjusting the outer edges of the room can also make a huge difference – even if you simply focus on one wall, adding interesting tiling or changing the colour of the paint can make the space pop in a way that it didn’t before can constitute a noticeable and impressive change. Top tip: Never feel like you need to make all of your decisions alone. Speak in detail to the specialists at any kitchen outlet you approach. Their advice will stand you in excellent stead to pick out the right fixtures and fittings for your purposes and to remain informed throughout the process. Cheap kitchens are far easier to put together if you ask the right questions – for example, if the units you’ve fallen in love with are a little too expensive, it’s always worth checking with a sales assistant to see if the retailer stocks something else that is similar but carries a slightly less daunting price tag. 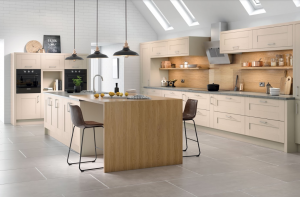 Browse through The Kitchen Warehouse’s affordable kitchens, units, individual kitchen doors and accessories to find out what we can offer you. You can also visit our showroom at Hutton Moor Farm, Hutton Conyers, Ripon, North Yorkshire, HG4 5LZ to take a look in person and pick out your favourite items to consider for your new design.